The LUCID 12 Inch Gel Memory Foam Mattress has many of the features and benefits that you’d expect from a regular mattress, but it can and does offer so much more. Made up of multiple layers, the LUCID memory foam mattress was especially designed to provide relief for back aches and other body pains that arise from a poor night’s sleep. Furthermore, the mattress provides comfort and health benefits for those who sleep on their side. The 12 Inch Gel Memory Foam Mattress has a pretty impressive construction, with an 8 inch high-density foam base, a 2″ 3 pound center and a 2 inch gel-infused 4 pound memory foam comfort layer. Together they combine to give you 12 inches of firmness and comfort that other mattresses will find hard to match. 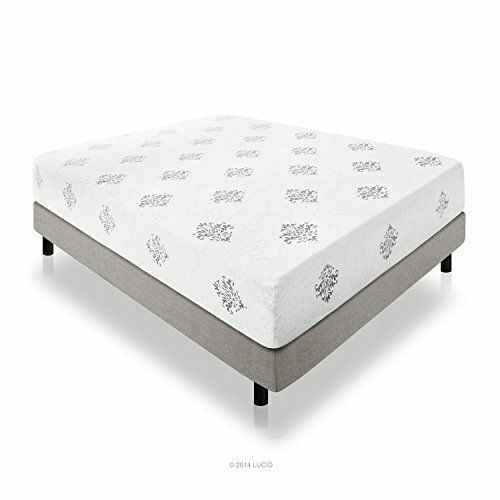 In addition, the mattress uses the company’s proprietary Lucid Gel formula, filling the foam with special gel beads that distribute heat evenly. One of the problems with regular foam mattresses is they spread heat out unevenly so that one area feels warm and the next, cool. Fortunately that’s not the case with this mattress as heat distribution is uniform. In addition, the memory foam mattress comes with a silver infused cover which is fully hypoallergenic and antimicrobial. The mattress’ design combines the best of traditional memory foam with proprietary technologies from the company so you get the best of both worlds. Apart from the benefits of memory foam, it also conforms to your body’s shape so you can sleep comfortably without feeling pressure on your back. Second, the ventilated gel beads make the mattress more breathable, allowing the material to soften quickly and adapt to your body’s shape. If you have tried other memory foam mattresses, you’ll notice that it takes a while before the contours align with your body, which causes discomfort and sudden awakenings. With LUCID that isn’t a problem anymore. The mattress also has the aforementioned pin core holes that improve airflow so you can sleep more soundly. The technology behind the design is quite complex, but basically what it does is cool the temperature the mattress, which research shows leads to a good night’s sleep. As indicated above, the mattress distributes heat evenly, and this is due to its pin core technology which ensures that the warmth level is kept at the appropriate stage. What all this translates to is very comfortable sleep, the kind of sleep that won’t give you body pains among waking, and neither will it produce unpleasant body impressions. Finally, it’s worth going over the cover again, as it’s one of the few in the market today that is naturally infused with antibacterial and antimicrobial protection. The infusion of silver in the fabric isn’t just for design purposes, as it also keeps microbes from infesting the mattress. Thanks to this fabric, you won’t just be sleeping soundly, but you’ll do so on a mattress that is clean and healthy. The silver infusion on the fabric is designed to last, so frequent washing and use isn’t going to result in its loss. Finally, its application of open cell technology goes a long way towards improving air circulation. Since this mattress became available it’s been reviewed extensively, and most of the feedback has been very positive. John of Oregon says that the memory foam mattress is comfortable and does not produce odours as some foam mattresses can. Sean of Kansas agrees, saying that he’s been using it for five months and it still feels as good and when it was first purchased and always provides a good nights sleep. Thomas of Alabama says he purchased the mattress for his mother and reports that she’s happy with it, and that he’d recommend it to anyone who wants a firm mattress. Other customers like Oliver of Boston and Albert of San Francisco also share the same sentiments, along with many others. Not all reviews are positive, but for the vast majority the mattress is just what the doctor ordered as far as back pain relief is concerned. There are lots of memory foam mattresses online, but the 12 Inch Gel Memory Foam Mattress is clearly one of the best. It doesn’t have all the bells and whistles that other mattresses may have, but it delivers in the most important aspects, and that’s give you a good night’s sleep and wake up feeling refreshed and rejuvenated. This entry was posted on December 22, 2014 by admin.